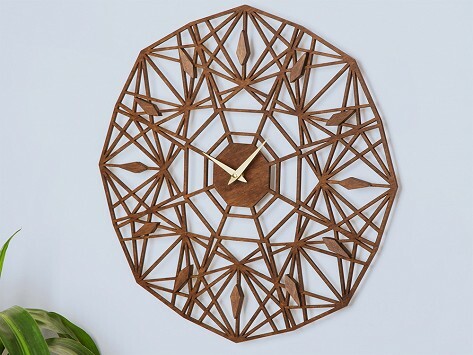 Sarah Mimo’s intricate laser-cut clocks are disguised as geometric artwork. Each is Made in the USA from premium Birchwood with an earthy finish, and integrates the wall into its design. Sara even gives you the option of whether your clock ticks or not. Dimensions: 19" x 19" x 1"
Sarah Mimo’s laser-cut clocks are so eye-catching that they stand on their own as art. Each elaborate timepiece is crafted from premium Birchwood here in the USA. Sarah traces clean lines into geometric images that integrate the wall as their background. Her idea was to create designs that command attention—even when you don’t need to check the time. Their eco-friendly, nontoxic, and VOC-free varnish gives them an earthy tint and a raw, organic vibe. 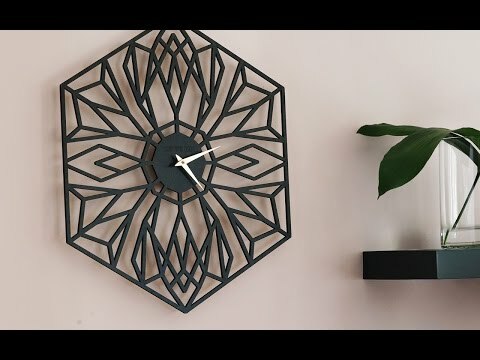 The way they spread out on the wall is a subtle nod to the 1950’s starburst clocks. To please those who like the “tic toc” sound, as well as those who don’t, Sarah includes the option to silence the movement. Either way, you’ll have beauty and functionality around the clock.